The naked mole rat has been a research subject of interest for decades, due to their novel social structure and unusual physiology. These rodents have been observed to be much less susceptible to cancer and other genetic abnormalities compared to other species in their class. Moreover, it appears that the naked mole-rat has a much greater lifespan than other animals of a comparable weight and size. A new paper, published in the journal Ecology, goes even further along this scientific line in claiming that naked mole rats may not even age as is normal in animals. The group behind this paper, led by the researcher Rochelle Buffenstein, assert that a captive population from the species are not subject to increased risks of death as their lives progress. This phenomenon directly contradicts the normal conventions of aging in the vast majority of species, including humans. Naked mole rats (or Heterocephalus glaber) are a type of rodent without body hair or significant visual capabilities, and therefore appear wrinkled and vulnerable in normal conditions. They live in a network of burrows (which they build themselves) and are ‘ruled’ by a queen, or dominant matriarch, who ensures her younger female relatives do not breed in her burrow to compete with her. Therefore, this species has developed a social structure more along the lines of swarm-forming insects such as ants or bees than that of typical rodents, who might live alone or in smaller family groups. This unusual lifestyle may explain why naked mole rats are not susceptible to the risk factors that affect most other rodent species in the wild. These mainly consist of predation and exposure, and may explain why most free-living members of this mammal class may not survive for longer than a single season. Comparable rodents, such as rats, bred in captivity may live for significantly longer, and yet not match up to the expectations humans derive from their weight and nutritional profiles. The lifespan of such animals is affected by other factors, which include bodyweight, age and the increased risk of various cancers as they age. Mole rats on the other hand, are known to be able to attain a total-life duration that is considerably longer than that of rodents; the average life span for a breeding female may be up to an impressive 17 years. Research has found that their lifespan is increased five-fold compared to other animals of comparable body mass. The mole rat lifespan is also threefold greater compared to other species with a similar onset of sexual maturity (approximately six months after birth). In ‘normal’ mammals, the duration of life is marked by physiological decline as it elapses, which is manifested by what we think of as aging. A number of known factors contribute to this decline, including the increased risk that important proteins involved in cell repair will degrade in structure, and therefore function, with time. The body may also produce or maintain fewer mitochondria as it ages, thus depleting the energy that essentially keeps cells alive. In addition, various ‘mistakes’ that arise in the expression of the genome, as this process is completed time and time again over the typical lifespan, may also affect the risks of aging. Epigenetic changes, such as the amount of methyl groups added to a DNA sequence, also contribute to aging. These factors may have a cumulative effect on tissue repair, heart health, bone density and many other aspects of health as an animal proceeds through life. In addition, the risk of cancer also increases with age, and may also increase the risk of mortality. Such factors are summed up in what are known as the Gompertzian rules of mortality. These are a series of equations and simple algorithms, developed by the researchers Gompertz and Makeham in the nineteenth century, that take all these factors as they apply to an individual into account to generate estimates of mortality risks and overall lifespan. One equation, which gives the ‘age-specific hazard’ also takes extrinsic, or non-physiological, factors such as occupational risks as a variable, and also balances the risks posed by both intrinsic and extrinsic factors to compute the actual hazard. None of this seems to apply to the naked mole rat, however. Research has found that age-related diseases, including cancer, are extremely rare in this animal. Furthermore, mole rats exhibit the ability to maintain its mitochondrial count throughout its lifespan, as well as the quality of its genetic and proteomic expression. 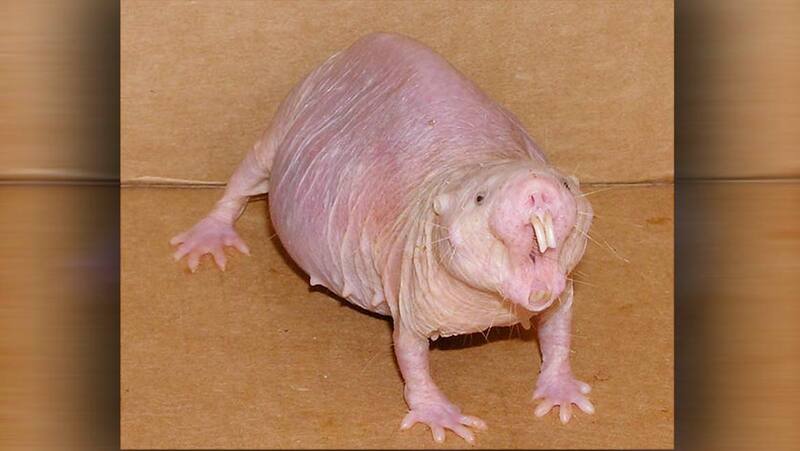 Therefore, the naked mole rat remains in optimal health throughout its life, right up until its death. In other words, intrinsic factors do not significantly affect the risk of death in this species, which allows it to break the Gompertzian ‘rules’ of mortality. In fact, the most prominent factor affecting death in the naked mole rat may be the safety of the environment in which its burrow is located. H. glaber has been observed to respond to this variable by speeding up reproduction and dying younger. On the other hand, the studies that produce these results tend to be rather short-term or based on relatively small colonies (one colony can have as many as 300 members). Therefore, the recent study published in Ecology studied mortality rates and risks using a database of colony surveillance recorded for about 35 years. It offered over 3000 usable data-points, from which the researchers analysed age-specific hazards and survival metrics for the animals in question. They found that a sizeable number of this population lived to be 30 years of age. Furthermore, their risk of mortality did not increase with age, contrary to the normal results of age-specific hazard analysis. In fact, the age-specific hazard diminished as the rodents grew older, in direct contradiction to Gompertzian laws. These trends were also not affected by age after reproductive maturity. Therefore, it can be said that naked mole rats do not age – or do not age at anywhere near the same rate as normal animals, at least. The results of the study (conducted at Calico Life Sciences LLC by Buffenstein and her co-authors Megan Smith and J. Graham Ruby) are thought to be related to the species’ physiological resilience and breeding status (i.e. reproducing animals had an even lower hazard rating than their non-reproducing counterparts). The researchers behind this study now also conclude that a new model of aging is needed that is specifically tailored to the naked mole rat lifespan. The naked mole rat is a species with exceptional resistance to the normal, age-related rates of physiological decline seen in most organisms. It is possible that they should be studied in closer detail for new insights on how to prevent conditions like cancer in humans. Perhaps one day science will help us achieve the non-Gompertzian lifespans to match this fascinating creature. Ruby JG, Smith M, Buffenstein R. Naked mole-rat mortality rates defy Gompertzian laws by not increasing with age. eLife. 2018;7:e31157. Austad SN. Methusaleh's Zoo: how nature provides us with clues for extending human health span. Journal of comparative pathology. 2010;142 Suppl 1:S10-21.